Jordan Ellis is the founder of The Sartorial Geek podcast, magazine and blog. She is also the owner and operator of Jordandené (jordandene.com), maker of handmade nerdy apparel and home goods. Claire White and Kyle Willoughby were excited to chat with someone involved in so many layers of nerd community. 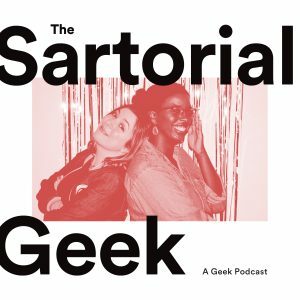 They discuss her first encounter with nerd culture, the best way to welcome newcomers, and what it’s like to see nerd fashion in high end retailers. Our hosts and Jordan conclude by discussing favorite fandoms past, present, and future. Previous 72: The Dark Knight Returns – Claire’s Birthday Spectacular! Next 74: Hyperion – Kyle’s Birthday Spectacular!